flower bud clusters can be cooked as vegetable. stem pith can be added to soups as thickener. 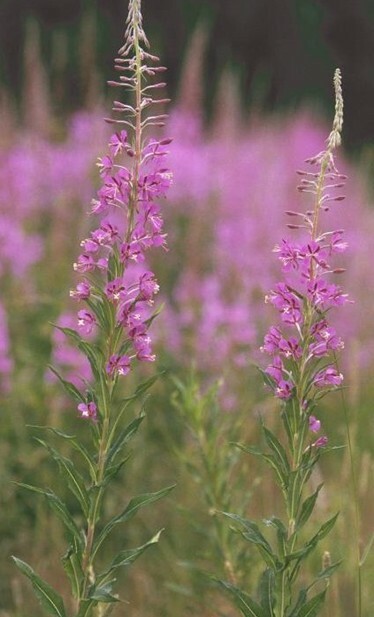 varieties in Ontario are Common fireweed (Epilobium angustifolium) and Dwarf fireweed (Epilobium latifolium). grows in open, disturbed areas in foothill, montane, alpine and subalpine regions. warning: may act as a laxtative if eaten in quantity. Fireweed is one of the easier edible plants to find. As you might guess from its name, the plant thrives in areas that have been burned out in a forest fire. It's not hard to find fireweed by roadways through the rocky mountains and even in city parks and vacant lots. When I'm hiking and come across abundant patches of fireweed I like to pick some and eat the pith while I'm walking. I take a segment of the stalk, remove all the leaves, and using my fingernail split the stalk right down the middle. Then I run the piece of stalk through my teeth to collect the pith. It's a refreshing, but not exactly a hardy meal.